Wedding is a bonding where the heartbeat becomes the voice and nothing is said in such a manner like nothing is left unsaid. 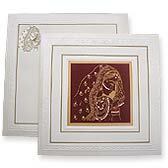 Red color in a wedding function always symbolizes love. The theme of the invitation card too is based on this fact. 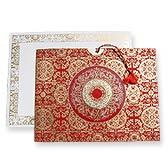 A white envelope with red design, spread all over the card, marks the beginning of the invitation card. 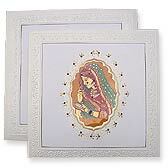 A motif can be placed along with slight glitter around it forms the center of the card. 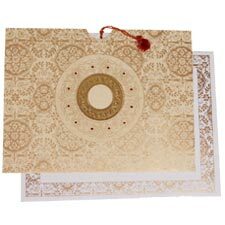 Two plain leafs inside forms free space for stretching the invitation words. These leafs are united with a ribbon. 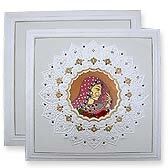 Size : 8.75" X 8.75"